Wander into any bar in Spain, order a drink, and the waiter will likely hand you free tapas. Very often it’s some type of pork — jamón (ham), chorizo (spicy sausage) or panceta (cured bacon). You could say this country is obsessed with cured pork products. People joke that even vegetarians in Spain eat jamón. But jamón ibérico is a treat observant Muslims — who don’t eat pork for religious reasons — can’t enjoy. Deep in the Huelva mountains of Andalusia, in Cumbres Mayores, a town in the heart of Spain’s most traditional ham-producing region, a Tunisian émigré has created the country’s first halal jamón, certified by Islamic authorities. “The first time I came with my family to Spain, to Andalusia, I said, ‘Why don’t the Muslims have this?’ ” says Faysal Mrad Dali, who was born and raised in Tunisia. He moved to Cumbres Mayores three years ago to launch his company, Balkis Gourmet. Dali’s halal ham is actually made from lamb, and occasionally beef. The animals are slaughtered in accordance with Muslim traditions, and the meat is cured in the most traditional Spanish method, for a minimum of six months, just like the pork jamón makers. He uses fresh local spices — thyme, paprika, oregano. Cumbres Mayores sits at more than 2,300 feet above sea level. Locals say there’s something in the air, which is cooler and moister than Seville 80 miles to its south, that helps dry and cure meat to perfection. Dali’s halal ham looks and tastes exactly like pork — which is the goal, but also a potential problem. There’s a “psychological barrier” for some Muslims, Dali says, against eating anything that looks and tastes so much like pork. All of Balkis Gourmet’s products have a huge halal sticker on the packaging, from the European Islamic Halal Certification. Dali sells his products online across Europe and here in Spain. He insists he’s still just starting out, and won’t disclose the volume of his sales. But he recently rented a much larger curing facility, just around the corner from the one where he founded Balkis Gourmet. Among his clients are restaurants near Granada’s Alhambra, the palace of Muslim kings who ruled Spain in the Middle Ages. He is also preparing to open his first retail outlet in Belgium in early 2015. Domah says halal tourism is approaching a nearly $200 billion market worldwide. And it’s pushing the boundaries of traditional Muslim products — there’s even a company making halal champagne. The Spanish government does not track tourists by religion, only by nationality. Last year, the country saw an 85-percent increase in tourists from Saudi Arabia, compared to the previous year; Algerian arrivals rose by 30 percent, and Turks by 57 percent, over the same period. Germans and Britons still make up the largest share of Spain’s tourist arrivals — and a portion of them are Muslims as well. 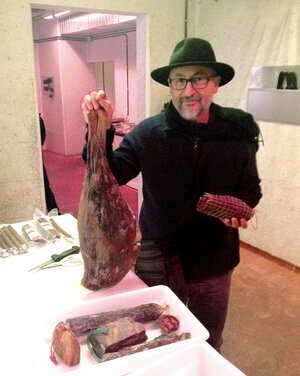 Halal products like Dali’s lamb ham are one way Spain is trying to accommodate this influx of Muslim tourists. Some are Arabs from the Gulf, who vacation in Spain during Ramadan or the summer months, and have money to spend in Spain’s debt-ridden economy. The Spanish unemployment rate still tops 23-percent. Incidentally, Spain doesn’t want Jews to miss out on the authentic jamón experience either. There’s kosher Spanish jamón too — usually made from duck or goose.